Like a preacher from the pulpit, I have tried to inform, warn and hopefully educate the naïve to the pitfalls of buying fine jewelry; I think it is safe to say if the price is really cheap, so is the “fine” jewelry you just purchased. It can begin with poorly informed salespeople, for instance the woman you meet while on vacation in Mexico, selling her wares from a horse blanket on the ground; it will probably result in the gold ring not exactly being solid gold. And then you can get the exact result from a fancy jewelry store in Cancun that makes millions by fleecing the tourists. If you are not jewelry aware, you are susceptible to being…I’ll come to the point…Swindled! Call it what you like, a bad mistake or an extremely poor purchase, bottom line…the seller got the gold, you got the shaft. Rarely a day goes by I’m not the giver of bad news, when assessing someone’s overseas purchase. The best swindle so far was the couple that was so excited by their recent purchase of “raw emeralds” while in South America. Luckily their investment was only $500. Upon my examination I started to chuckle under my breath and grabbed a nearby cigar lighter, and to their horror lit an “emerald” on fire. It burned and melted like candle wax. The emerald was in fact, green plastic. I had once read in a trade magazine that it was a common practice for the poor street kids to shimmy up traffic poles and relinquish the green plastic “go” lenses, break them up, polish the chunks and sell them to unsuspecting tourists. There are many scams throughout Europe where gypsys attempt to sell heavy high polished brass rings they “found” on the ground right before your eyes and swindle you for whatever they can. I have several in the store from folks who fell for this scam. While these examples may seem small time to many, it gets more and more daring, and can involve thousands of dollars of your money. High quality looking rings with dismal quality diamonds, or treated gemstones that are worth only a fraction of its proposed value, these so-called jewelry auctions at major hotels come to mind. Avoid them like the plague. I have yet to see a single bargain from these medicine shows, and once burned it is near impossible to get retribution for your mistake. Worse, it’s all legal, with “no refunds, no returns” clearly stated right on the sales slip. I once appraised an auction-purchased heavy gold diamond tennis bracelet, that the buyers paid $20,000 for right here on the island. While the bracelet itself was of the highest quality, the diamonds (and I use the word diamonds loosely!) were the most atrocious quality I had ever laid my eyes on. To me diamonds this bad have zero value. Next was the $10,000 emerald ring, and that was more hideous than the diamonds. Imagine paying 30K for a lot of nothing. I doubt they got their money back. There are so many imitations for diamonds and most precious gemstones that it is near impossible to detect unless you are a gemologist, so the public has to really beware of bargains. Remember that large-sized red ruby stone in the old school ring of yours? That beautiful red stone is synthetic (man-made) and near worthless. I recently purchased some “treated” rubies that are visually quite beautiful and in large sizes only thing is they are really, really cheap. Why? Because the gem dealer informed me as to what I was actually buying glass infused rubies. I bought them inexpensively and will sell them inexpensively when I make rings out of them. And the buyer will be informed why they cost thousands less than non-treated. Information is a valuable tool when spending hard earned money on diamonds and gems. And dealing with a trusted jeweler is paramount to the whole experience. 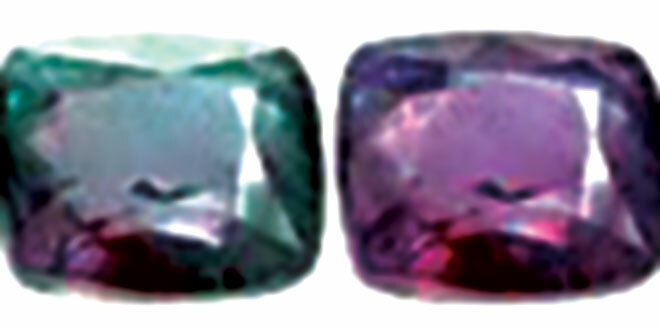 Lots of jewelers sell imitation gemstones. Heck, have you noticed the large diamonds many of island’s ladies are sporting on their fingers lately? What if I told you almost a third of them were cubic zirconia (fake diamond). So just send a stamped self-addressed envelope and I will send you a current list of all the island imposters and the real diamonds wearers. Please don’t…I’m kidding you! They would burn me at the stake for sure! Buying certified diamonds may cost a bit more but they have been examined by a professional gem lab and the description and quality of the diamond is plainly written in black and white, many important colored gemstones also come with certification papers. The whole gist of this column is to know what you are buying and from whom and make sure it is in writing and clearly states what your recourse is if there is buyer’s remorse. Richard Alan Is a designer/goldsmith and a purveyor of fine diamonds and gemstones for over forty-five years and Marco’s trusted jeweler for twenty-two years and welcomes your questions about all that glitters. Phone: 239-394-9275, website:www.harborgoldsmith.com, email: harborgoldsmith@comcast.net.